Home > Blog > Skydiving In Soflo! 3 Cool Places to Try Skydiving In Soflo! Some say skydivers have a death wish; others call them adrenaline junkies. We wouldn’t disagree on either count, but our reason for taking the jump would be just as valid as anyone else’s. It’s a life-altering experience and different each time.Besides, what better place to skydive than in South Florida. Located at the Homestead General Airport, Skydive Miami uses a large modern indoor facility with plenty of room for your friends to come and be a part of the “scene”. They offer an indoor air-conditioned packing area, with Certified Parachute Riggers on staff. The airplane is a Cessna Caravan (15 place) and their pilots are highly experienced and oversee the regular maintenance of the aircraft by FAA certified mechanics. These guys and gals use only the most advanced “State of the Art” equipment available. Both the main and reserve parachutes are “Square”, known both for their reliability and soft landings. The equipment here is routinely inspected in an ongoing effort to provide you with a new and well maintained inventory. On all of the student equipment, they have installed a new mini-computer “Automatic Opener” called CYPRES. It is designed to deploy the reserve parachute if the jumper fails to pull the ripcord. Safety first right? Skydive Spaceland’s Florida location is one of the longest-running skydiving centers in the state; Airglades Airport has hosted skydiving for more than 29 years with one of the best safety records in the industry. Surrounded by 2 square miles of airport and endless acres of sugar cane fields, so landing obstacles are few and far between. Lake Okeechobee, the United States’ second largest freshwater lake, is located 4 miles north of their drop zone and presents a gorgeous scenic backdrop for our South Florida skydiving friends. 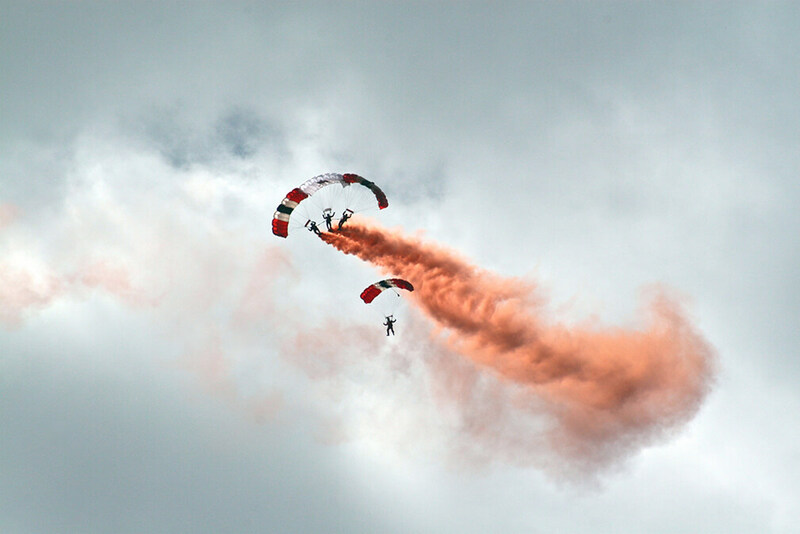 Friends and family are encouraged to come and watch skydivers as they board the aircraft, freefall from up to 13,500 feet, and land in our spectator viewing area. An easy driving distance from the Palm Beaches, Fort Lauderdale, Miami, Port Charlotte, Fort Myers, Naples and surrounding areas. The staff and aircraft can handle all of your needs whether you’re skydiving by yourself or bringing a group. Have you seen our skydiving discounts, and did you know you can skydive for free? You’ll enjoy skydiving over the Florida Coastline! Whether its your First Time Tandem Skydiving in Florida, you are Learning to Skydive Independently at our year-round school for the Accelerated Freefall Course (AFF) or you are an Experienced Skydiver looking for a “destination” or a “home” drop zone. The drop zone is “actually” located on the Central Florida Coastline. Jumpers have an incredible view of the Sebastian, Florida Inlet and the Atlantic Ocean while in freefall and under canopy, as well as an enjoyable coastal environment after landing. Their Florida location, east of I-95 on the coastline, is a convenient drive for skydivers from Orlando, Palm Beach, Broward and Miami-Dade County, making it the most accessible Florida skydiving destination. The Staff at Skydive Sebastian is committed to making everyone feel at home here, whether they are a first-time tandem skydiver, a recent Accelerated Freefall Course graduate, one of our regulars, or a visitor spending a vacation at our Drop Zone. At Skydive Sebastian they have it all…load organizing, beach skydives, The Zoo Bar and Cafe, skydiving gear store for your gear needs, on-site rigging services and one of the friendliest skydiving staffs not only in Florida, but in the world. ← Yoga On The Beach!